“1-2-3-GLOW!” the crowd yelled. 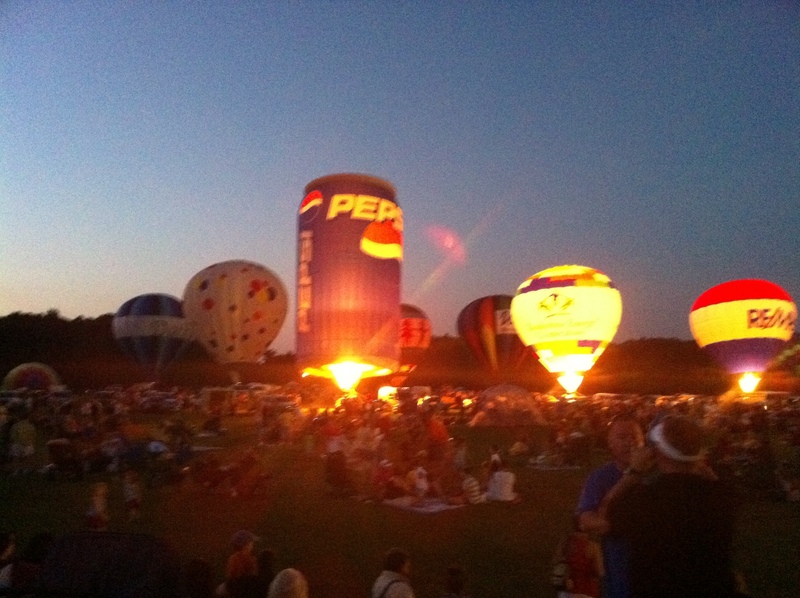 The giant balloons lit their flames in unison, creating a lovely display of color across the horizon. Moments earlier we’d started across the same field in broad daylight just as dusk began. We crossed it, visiting our favorite balloons up close–a gigantic dinosaur, a familiar Pepsi can, one with children holding hands around its belly. Just as we sat down to enjoy our ice cream treats, we surveyed the field before us and darkness fell down on the horizon like a curtain. 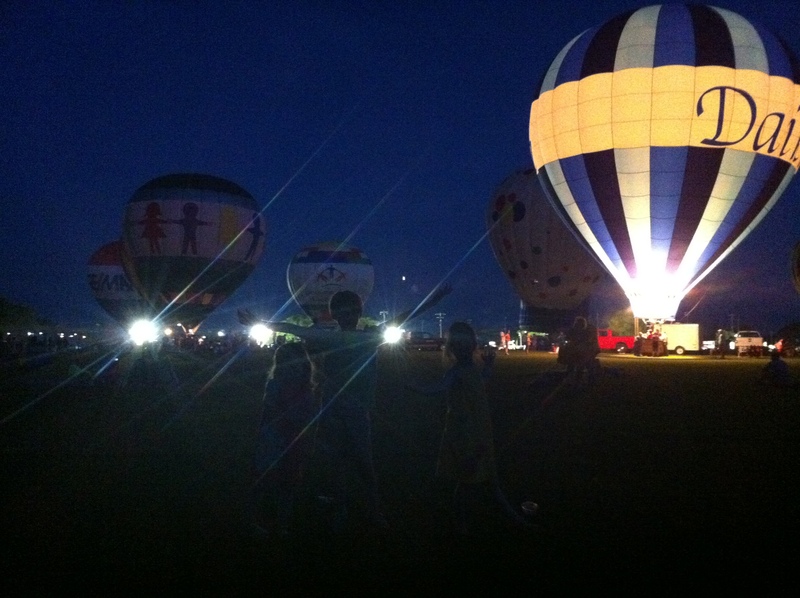 Shaped like lightbulbs, the balloons took turns lighting up the sky until the crowd asked them to create the glow together. It was a magical sight! Even more fun was that the event was held in a public field adjacent to the backyard of one of our friends. 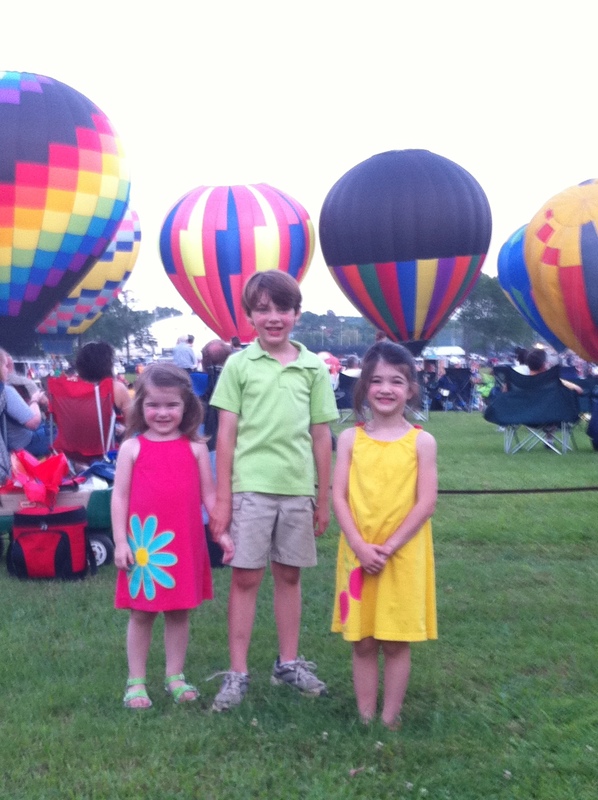 We drove to their house and enjoyed the backyard party and could walk right over to the big event. 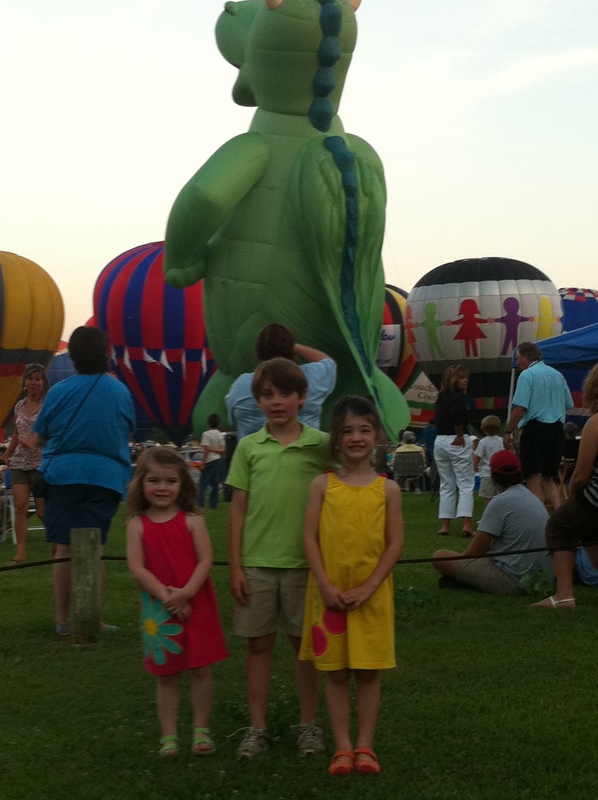 The real treat for me was getting to see my friend and her sister, who had come into town for the balloon party. These aren’t just any friends, they are some of my longest-standing friends whom I have shared some of life’s most dramatic and exciting moments with. I met Melanie when I first pledged a sorority in 1991. Soon after I met her sister, Melissa, who soon after became one of the most precious blessings of my college experience. The years to follow were some of the most fun years of my life, full of memories we will always cherish, and moments who shaped the people we are today. These girls and their entire family–sisters, grandparents, cousins, there is hardly anyone in their entire family that I do not know–became like my own family. We have laughed together–oh, we have laughed–beginning with our first memory (of a party cake, no less) and throughout many, many more. We have cried together as we have suffered loss and heartbreak. We have even weathered arguments that would have divided most households! We have felt each other’s pain when one of us has been hurt or experienced a challenge in life that has been frightening or scary. We have befriended one another’s new sets of friends along the way, and moved through the new phases of life that adult hood has sent to us. We have been so close that we have talked everyday, sometimes several times, and we have gone for weeks or months without finding a moment to call, but when we find a moment to connect again, we just pick right up where we left off, as if we’d just spoken yesterday in the grocery store over a head of lettuce. With these kind of friends there is no backstory, no catching up, no explanation. I just talk and they know the nuances involved in what I am saying. There are no apologies for how I look or how I feel or what I might say that doesn’t quite come out right. They just know. It is so special to walk into a backyard full of almost-strangers and see a handful of people who support my dearest friend on a daily basis the way I wish I could, and for them to accept me as one of their own too. It is so special to see my friend among the busy-ness of it all, with her precious family thriving and happy, in her “element,” still the social chairman, all these years later. It’s not the same kind of party we used to throw, way back when with the party cake. But then again, we don’t have the same kind of glow as we did back then either. Our “glow” is a different kind of glow. 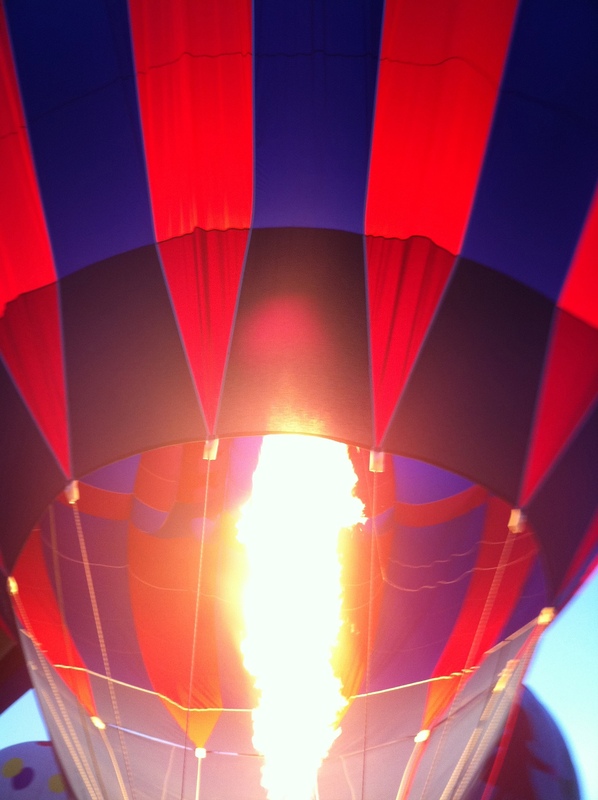 Like the balloons across the street, we glow from the inside now. We’re powered by a different kind of spark, and for that, I’m thankful. And for her company in my friends on the horizon of my life, I’m especially grateful.